Followers of this blog will have noted that various test builds of my artwork coming together and I am now able to offer a number of these for sale under the name of Miscellany Models. First up is a Highland Railway/LMS/BR diagram 51 full brake – priced at £48.00 for a 4mm and is suitable for OO, EM or P4. These were the last generation of full brake produced by the Highland, built with both cupboard doors and sliding doors as well as alternative forms of guards duckets (all of these are included in the kit). 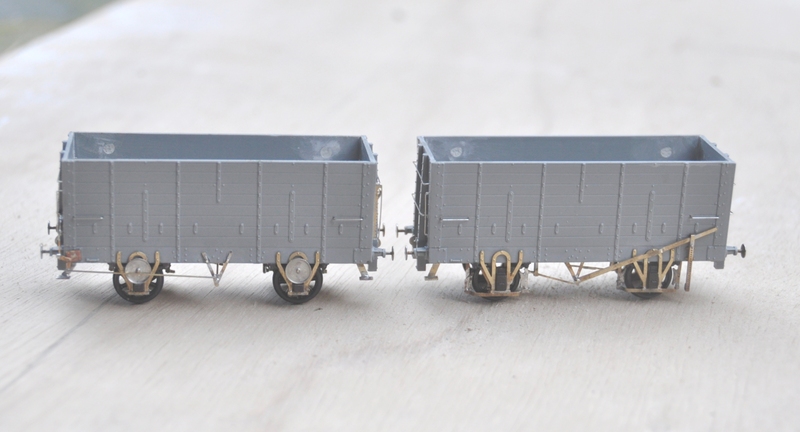 The kit inclusive of fully sprung Fox bogies (see below), roof, corridor connections (also see below) but all castings and buffers will need to be sourced separately. The castings for the bogies are proposed, but are not presently available. 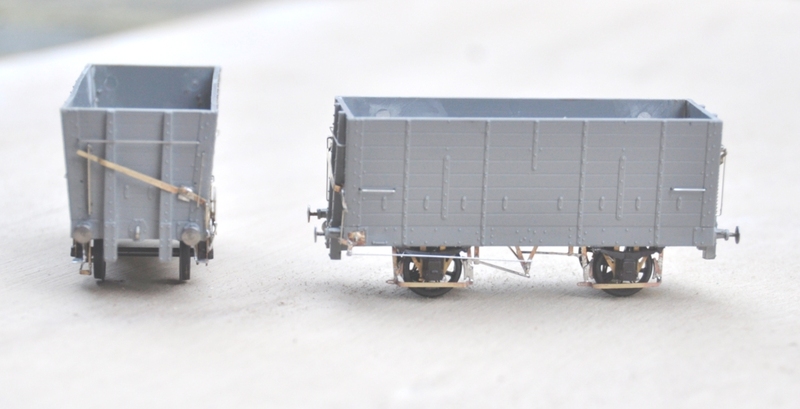 As was common with many pre-grouping coaches these vehicles utilised Fox Bogies (£16.00) and these are being made separately to the remainder of the kit, These bogies have been developed in conjunction with Justin at Rumney Models and are fully sprung, with both the axleboxes and the bolsters sprung. They really do glide across track and look as if they weigh many tons rather than a few grams! They need castings for your favoured axleboxes/springs and bolsters but do include the foot steps and all of the bogies sides, brakes and details. Suitable for oo, EM and P4. 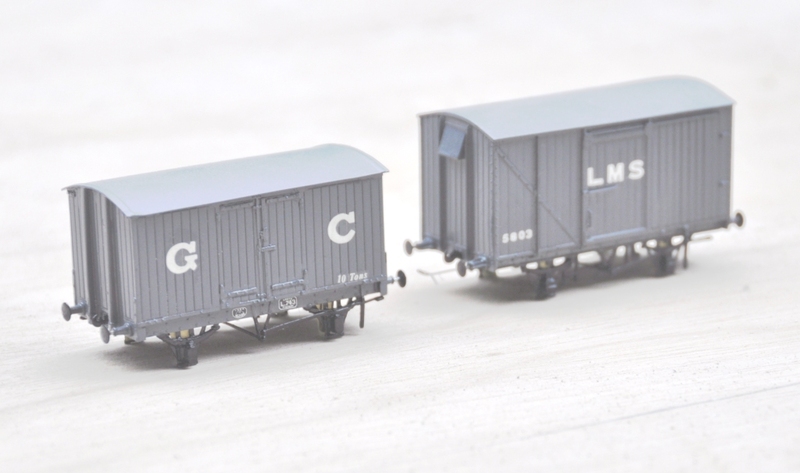 The second coach kit is for a MR/LMS/BR: Dia 530 Passenger Brake – priced at £36.00 in 4mm scale (suitable for OO, EM and P4). This prototype was built in some numbers and by the 1920s they were spread extensively across the LMS system. The kit is for full etches covering the roof, body, underframe and footboards plus parts for the sliding central axle included. It needs axlebox/springs (available from Branchlines or Coopercraft), gas lamps, buffers, brake and gas cylinders. 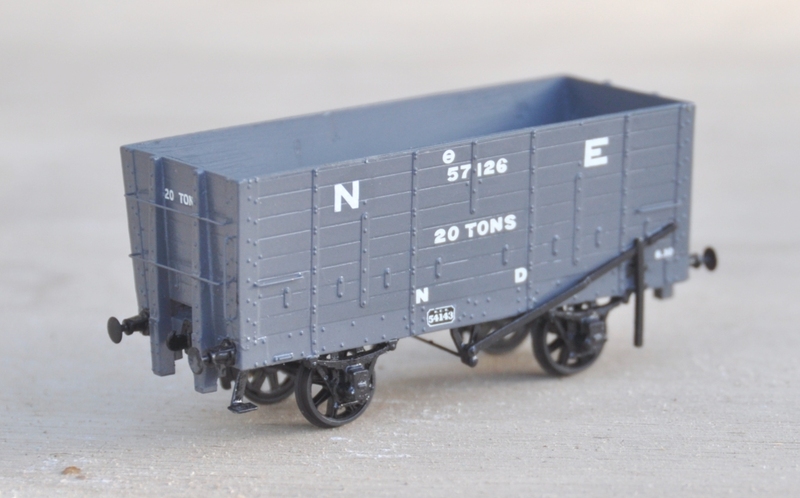 On the wagon front, there is an etch to detail the NER/LNER/BR: Dia P7 Hopper Wagon – £13.50 4mm (sufficient for two wagons). 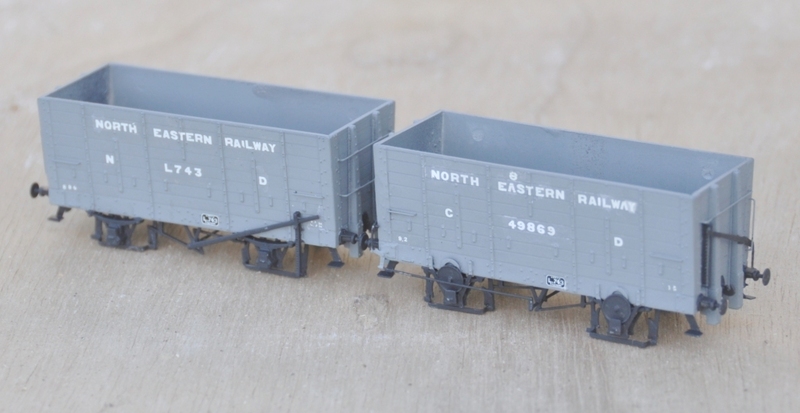 They cater for a large number of the variants to this numerous and long lasting hopper wagon. Needs wheels and the Slaters kit P7 kit for the donor model. Variants that can be made include the end braked version, improved components for the Morton braked version, outside twin W irons and also the anti-friction wheel device. All of these have been extensively road tested by me with a couple of test builds for each of them. You can see this unfold on my blog and if you are interested in seeing how they go together do take a look! Please remember that the availability of these models is an adjunct to my own hobby and this has to be accommodated within the constraints of my day job and general life! In particular I can’t get to post these orders until Saturdays so do please give me a little slack when it comes to getting the goods to you! I am sure I am not alone in having in mind a list of modelling jobs to do over the Christmas break and to find that the bulk of the list remains uncompleted when it is time to go back to work!! One item on my list was to finish a North Eastern Railway autocoach that I have had underway for a while and that at least has got itself off the list! The bulk of this is from a D&S etched kit which I have seriously devalued by opening the box!! I have replaced the fixed bogies with some test build sprung bogies that I have had under development for rather too long now (they are finished, but for the castings which I need now to produce following the demise of Lochgorm Models for at least the time being). I also replaced the roof with some metal sheet rolled to the curves. This proved a real challenge and took more than one attempt as I found you could not roll the section with the holes for the clerestory already cut as the bend all occurred at this weakened point. I also took the effort to put on the gas lines with fine wire as I think these add so much to a model of this era. I think they are very attractive coaches but there is a problem with them – they tended to go in pairs so I have another to build! Just not quite yet! Fortunately, the BPT is not down to me, but I think you may find yourself under pressure soon John!!!! Following from last week’s post, here are a selection of further photographs from Benfieldside’s outing at the South Hants show, starting with a few around the platforms. One of the charms of the layout are its buildings; typically constructed from cereal packets – good old fashioned modelling but very effective as you can see! There remains a lot of stock to build for the layout and also a fair amount of restoration; the next bit of restoration can be seen in the picture below; a somewhat wonky signal (which will be rebuilt as a two doll to act as a starter signal for both the bay and the main loop). Hopefully, this will be done for ExpoEM, which is the layout’s next outing – see you there? Many thanks to Dave Brandreth for the photographs in this post, along with some of those in its predecessor. Benfieldside has just completed its first outing for what is believed to be 17 years and whilst honesty dictates that we must admit to some glitches; especially first thing, on the whole it went really very well. As I have a fair number of photographs (some with thanks to David Brandreth), I will spread these over a pair of posts to keep people on tenterhooks! A NER C class (to become a LNER J21) pauses at the starter with a freight train. The same train in the distance, showing the goods yard with the station throat behind. Things are quieter at the other end of the station where there is a full brake in the milk bay. The signalman has a commanding view; in part of the slightly droopy signal on the gallows signal! Because we were so pleased simply to having it running, there was no pretence to running a sensible service (and we were a little short of stock, particularly passenger stock). Thus, the poor coal merchant went without any delivery of coal all day! At least it looks as if he has enough to keep the coal fires of Benfieldside going for a little longer. Next door, it seems like it might be lunch break at Iliffe & Stokes; builders, joiners and undertakers. Moor to follow in a few days time…………… If you don’t already do so, you can subscribe to this blog by entering your email address in at the top left of the page. This means you will be sent an email each time I post anything on the blog. In just over a week from now, I will be down in Portsmouth for the South Hants Model Railway Club’s annual show. Despite being a one day show, I find the show to be a good quality finescale show and the crew down there are very friendly, so it is definitely worth visiting. You can find details of the show here. I can assure you it is worth coming to the show to see this alone; and you might even find my latest construction effort – although probably still shiny like this. This is a D&S Models NER auto-carriage and really needs a sister to work with it but that will have to wait! Stop by and say hello if you do visit.